With so many Green City, Clean Waters green infrastructure projects planned for neighborhoods all over the city, we at Philadelphia Water are always looking for ways to let residents know about upcoming work that will improve stormwater management in their area. In that spirit, we created colorful new street decals that will be placed in neighborhoods where construction for Green City, Clean Waters projects is scheduled to start within six months. Residents are invited to join Philadelphia Water representatives on Thursday, April 28 at the Philadelphia Protestant Home Social Hall, 6401 Martins Mill Rd. to learn more about important stormwater improvements proposed for streets near the Har Nebo Cemetery and the Philadelphia Protestant Home. The meeting and presentation will start at 6:30 p.m.
• Martins Mill Rd. between Hellerman Street and Tabor Ave.
• Devereaux Ave. between Trotter Street and Summerdale Ave.
• Devereaux Ave. between Algon Ave and Langdon Ave.
• Algon Ave from Deveraeux Ave. to Oxford Ave.
• Oxford Ave. from Devereaux Ave to Benner St. The purposed of the meeting is to provide a summary of improvements planned for these streets, and residents are invited to provide feedback on proposed designs. Representatives of the Tookany/Tacony-Frankford Creek Watershed Partnership will also be present to discuss the importance of protecting local waterways from stormwater pollution. For more information about these Green City, Clean Waters improvements, contact Philadelphia Water Outreach Specialist Hailey Stern at Hailey Stern@phila.gov. Click here to see a meeting flyer that you can share with neighbors. Residents are encouraged to attend the meeting to learn more about the projects and provide feedback on proposed designs. For more information, contact Maggie Dunn at maggie.dunn@phila.gov or call 215-971-6151. Click here to see a meeting flyer that you can share with neighbors. The Woodland Dam is currently preventing many species of fish from reaching the upper parts of Cobbs Creek. Philadelphia Water and the Army Corps are planning to remove it. Credit: Philadelphia Water. Residents are invited to join staff from Philadelphia Water and the U.S. Army Corps of Engineers at the Cobbs Creek Environmental Education Center tomorrow at 6 p.m. to learn about an exciting new project that will open up miles of the Cobbs to fish like the blueback herring, a historically important migratory species whose habitat has been limited by dams across the region. The map above shows the current plans proposed for the Lawncrest area (click for larger image). Click here to see a detail of the green tools proposed for the Lawncrest Recreation Center. Credit: Philadelphia Water. Nearly 100 Northeast residents came out to a community meeting last week to get updates on what will likely be one of the biggest combined Green City, Clean Waters projects planned since the program began in 2011. Held with Philadelphia Parks and Recreation, the Lawncrest Recreation Center Advisory Council and the Tookany-Tacony-Frankford Watershed Partnership, the March 7 meeting was organized by Philadelphia Water and focused on green stormwater improvements being designed for Lawncrest Rec and the surrounding area. With over 80 green stormwater tools spread across the rec center and local streets, the proposed improvements will provide new landscaping and green space while vastly enhancing the area’s ability to manage the rain that falls on local roofs, streets and other hard surfaces during storms. While this complex series of projects is still taking shape, the current designs would allow those green tools to manage about 978,000 gallons of water every time we get an inch of precipitation. In Philly, that kind of storm happens about 65 times per year—meaning the Lawncrest Green City, Clean Waters projects could keep as much as 63.5 million gallons of stormwater out of our sewers and streams annually when completed. New Green City, Clean Waters tools will manage stormwater from the roof of this building and more. Credit: Philadelphia Water. Francis Myers Recreation Center is a big, beautiful Philadelphia Parks and Recreation site in Southwest Philly. For Philadelphia Water, that big rec center presents a big opportunity to manage the site’s stormwater, which can overwhelm local sewers when it rains and lead to sewage overflows that pollute our rivers. That’s why we’re thrilled to be working with Parks and Recreation and the community to create green stormwater infrastructure for the area through our Green City, Clean Waters program. In addition to catching and filtering stormwater with plants, soil and stone, these important upgrades will also beautify the area, making Francis Myers a greener and even more inviting place for all residents. The proposed stormwater management plan for Guerin Recreation Center presented at the community meeting on October 26, 2015. Credit: Philadelphia Water. We hold lots of neighborhood meetings for our Green City, Clean Waters projects because we value feedback from residents. Our meeting Monday at Guerin Recreation Center caught a lot of attention—over 90 people came to voice their opinions on the stormwater management project proposed for the site. We work hard to get community members involved, so we appreciate that kind of turnout. As residents know, we've been working with Parks and Recreation and holding public meetings about Guerin improvements since 2012. We have two community meetings coming up this week to update residents on plans for green infrastructure improvements in their neighborhoods. These meetings are designed to provide important information about upcoming construction and to get feedback from neighbors, so if you live near one of these projects, please come out to learn more! This map shows the location of proposed green infrastructure investments near the East Poplar neighborhood. Click the map for a larger image in a new window. Credit: Philadelphia Water. Philadelphia Water first started discussions in 2014 with Parks and Recreation, the West Poplar Community Development Corporation, members of the Teens 4 Good farm at 8th and Poplar and others to see how Green City, Clean Waters investments could improve the area and help manage stormwater in a green way. Since then, we've used their feedback to inform plans for green stormwater infrastructure around the East Poplar Playground and nearby athletic field. In addition, we’ve planned several projects for nearby streets in the same neighborhood. Our goal is to reduce the volume of polluted stormwater entering local sewers that connect to the Delaware River with green tools that beautify the area – but we’re working with neighbors to make sure that doesn’t impact community gardens or people playing sports on the field. We’ll be hosting a meeting to update residents on the progress of stormwater management plans for the East Poplar neighborhood on Wednesday, Oct. 14 from 6-7 p.m. at the John F. Street Community Center, 1100 Poplar St. Please click here to view a full size version of the meeting flyer. This map shows the location of proposed green infrastructure investments near the Point Breeze neighborhood. Click the map for a larger image in a new window. Credit: Philadelphia Water. Talks about Green City, Clean Waters improvements around Wharton Square in the Point Breeze neighborhood are just getting started, so this is a great meeting for those who want to provide feedback and learn more about what this investment can bring to the neighborhood. In addition to a project at Wharton Square, Philadelphia Water is also working on two vacant lots and several streets in the area. View the map above to see the locations of upcoming and completed projects. Please click here for a full size version of our meeting flyer and bring your neighbors to the Wharton Square Recreation Center, 23rd and Wharton streets, on Oct. 15 from 6-7 p.m.! Can a Vacant Lot Be Beautiful AND Work for Our Rivers and Streams? We Say Yes. This map provides an overview of planned improvements at 55th and Hunter. Click the image for a larger version. Credit: Philadelphia Water. On Tuesday, we broke ground on a new project—our first official vacant lot site—that truly speaks to what the Green City, Clean Waters program is all about. At its core, Green City, Clean Waters is about improving the water quality in our rivers and streams. But it’s also about improving our neighborhoods with green stormwater infrastructure that greens and beautifies communities. And it’s about forging partnerships with officials, other departments and government agencies, community groups, and non-profit organizations so that we can bring the benefits of Green City, Clean Waters to a diverse range of community improvement projects—from stormwater tree trenches added to routine sidewalk repairs to rain gardens that enhance schoolyard makeovers. Our Heston Lot and Baker Playground project has all of those elements. Located in the in the city’s Hestonville neighborhood, the playground and adjacent vacant lot at 55th and Hunter streets has long been in the care of dedicated groups like the Hestonville Civic Association and the Pennsylvania Horticultural Society (PHS), which has maintained the lot through the LandCare program. But, three years ago, City Councilman Curtis Jones approached Philadelphia Water to see if we wanted to get involved in efforts to revamp Baker and make Heston Lot a more inviting, park-like space for the neighborhood. Because we’re always looking for ways to expand the Green City, Clean Waters footprint, we jumped at the chance and set to work in designing green tools for the two sites. That was in 2012. Now, construction is underway, and we’re inviting the community to an Oct. 7 ground breaking celebration to learn more about what’s in store. Click Here For Event Details. Councilman Jones is in the process of implementing Heston Lot improvements that include fresh sidewalks, a new gazebo with benches and a wheel chair access path. The City’s Department of Public Property, which owns the lot, helped raise funds for the gazebo. 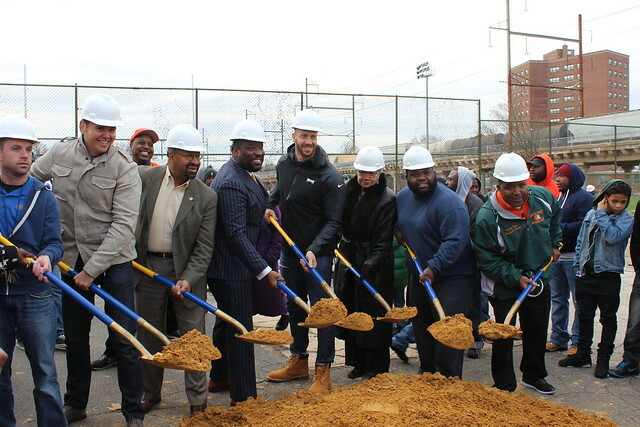 Across the street at Baker, Jones is working with and Philadelphia Parks and Recreation to bring improvements that include sidewalk upgrades, a Mural Arts installation and new heater. PHS is also donating a post-and-rail fence for Heston Lot. In all, Jones’ office contributed $140,000 for the projects. The U.S. Environmental Protection Agency also generously kicked in funding to help us with these projects and another nearby vacant land site. To enhance those improvements and meet the stormwater management goals of Green City, Clean Waters, Philadelphia Water is building rain gardens and subsurface storage trenches at both sites. While the rain gardens will provide landscaped green space for the neighborhood, we’re upping the community beautification aspects of the project by working with Mural Arts to install a water-themed mural at Heston Lot. Designed by artists Eurhi Jones and Michael Reali, the colorful piece highlights neighborhood connections to the Schuylkill River and includes aquatic wildlife such as American shad, river otters and a heron. Reali will add textural dimension to Jones’ design, making some of the water elements sparkle and shine through the use of mosaic materials. From an environmental perspective, the Heston Lot rain garden and storage trench will soak up and filter water from surrounding streets, and can hold 3,638 cubic feet of water. That’s equivalent to filling one SEPTA bus, 389 bathtubs, or leaving the faucet running for nearly 9.5 days! Across the street at Baker, that rain garden and storage trench will manage stormwater from 11,269 square feet of nearby impervious surfaces. The playground’s green tools have a stormwater storage capacity of 1,417 cubic feet, which is equivalent to 151 bathtubs of water or leaving a faucet running for over 88 hours. Combined, these sites provide the city with an additional 2.27 “greened acres”— that’s acres of impervious surface whose stormwater is now managed by Green City, Clean Waters tools. While the actual green tools currently being built in Hestonville are pretty typical for Green City, Clean Waters, we’re excited about the potential to bring more green infrastructure projects like this to other vacant land sites in the city. The negative impact of vacant lots on communities is well documented. If we can work with partners to tackle the challenges of vacant lots through Green City, Clean Waters, we’re effectively delivering a one-two punch that knocks out blighted areas and turns them into valuable community green spaces that also help improve our rivers and streams. Healthier rivers and streams. Greener, more beautiful neighborhoods. That’s what Green City, Clean Waters is all about, and the work underway at Heston Lot is shining example of what the program can achieve.